I don't usually make chutney. Actually I've never made chutney but I guess there is a first time for everything. When Debbie posted this recipe over on the forums at C&Z it seemed like a good time to begin my chutney making experiences. The stove top was getting a little jealous of all the attention the new oven has had this week. This morning I decided to lavish a little attention on the stove top. Now we have two jars of chutney in the pantry. I suspect one jar will be going to a certain person as part of my New Zealand Blog by Post package. Saute onion and garlic in a little oil until translucent but not browned. Add kiwi fruit, sultanas, spices. Simmer until sultanas plump and soft and kiwi fruit starting to lose shape (about35 minutes). 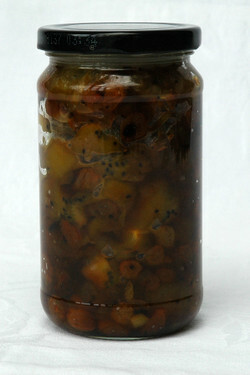 The vinegar should reduce to almost nothing and you will be left with a moist chutney. Serve with meats or hard cheeses and bread.